We take a look at the top 3 stove fans to fit any budget. 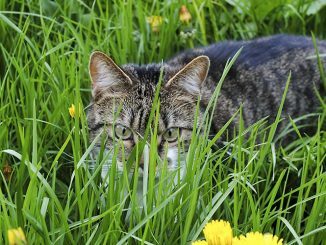 One of the most efficient, affordable and green methods of keeping your house warm is the use of pellet and wood stoves. However, since the warm air is not channelled through any ducts for distribution, only the air around the stove gets warm. So, to keep warm, you will need to stay close to the stove. You can solve the problem by purchasing a good stove fan. The fan circulates the hot air making the whole living space equally warm and comfortable. With tens of different models on the market today, it may be a little tough to get the best stove fan for your needs. We have reviewed 3 of the best stove fans out of tens of brand. 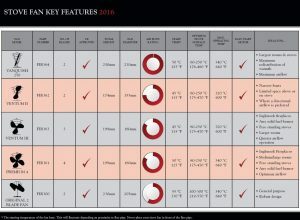 We have the best budget stove fan, the best value stove, and the best performing stove fan. 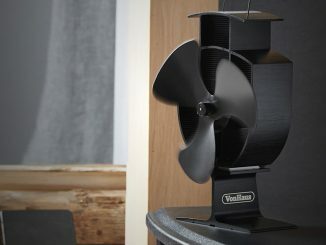 The VonHaus 3 Blade Stove Fan is designed to distribute heat across the room through its three blades. It has a thermo-electric module which converts the heat into electricity which in turn turns the blades. In addition, the fan is self-regulating. It increases the speed of rotation depending on the temperature in the room. This helps ensure that the house does not get too hot. The blades turn at an average of 130-150 CFM. This versatile fan starts to function when the heat reaches around 600C. It will continue to work up to a maximum temperature of 3000C. This is the ideal range for most pellet and log stoves. The VonHaus stove fan’s body is made of a strong steel material. 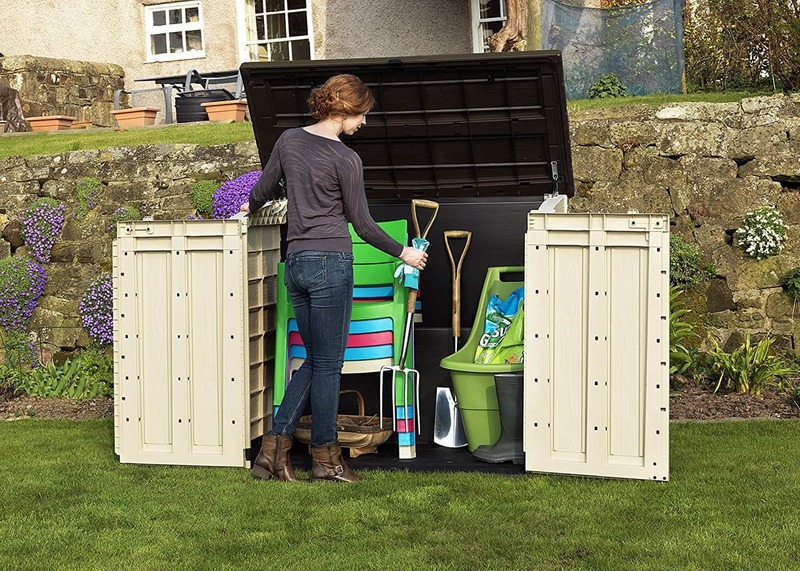 It is compact, light and comes with a 2-year warranty. All these features come with a lower price tag when compared to brands with similar features on the market. It offers premium features at a low cost than comparable brands. It is made of strong steel that can withstand high temperatures at the surface of the stove. The fan controls the speed of its blades according to the temperature of the room. It tends to get clogged with dust fast. 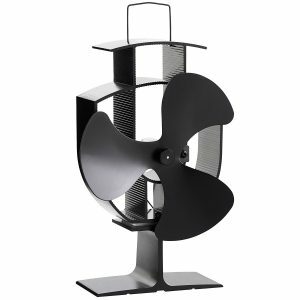 The VonHaus 3 blade Stove fan is ideal for a small to midsize room. It generates enough air flow to keep the heat distributed in these spaces. The self-regulating fan is reliable, lightweight and easy to use. Valiant (FIR361) is a heat powered stove fan ideal for small to moderate sized rooms. The four-blade stove fan generates airflow of around 420 feet per minute which is ideal for pushing hot air across a standard living room. The fan has a compact design and is only 199mmm high. This size allows you to store in small places. It has a radiating fin design which enables it to generate better airflow even at lower temperatures. Its thermo-electricity module starts to work at a temperature of 500C to about 2500C, a perfect temperature for top cooled log stoves. It also comes with a thermally controlled actuator that optimizes Peltier performance. If the heat goes beyond the operating range, the fan’s inbuilt protection shuts the fan to prevent damage. 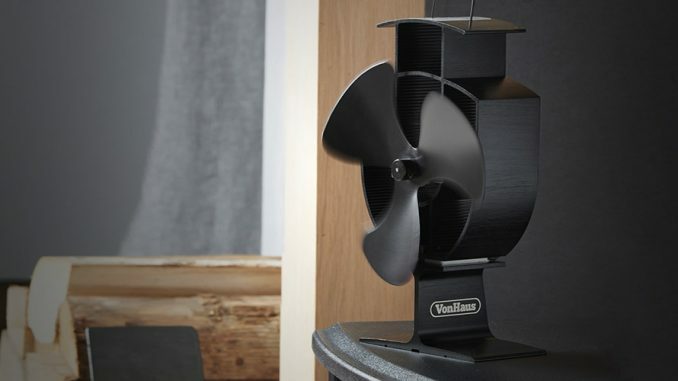 The fan is made of the anodised aluminium base which comes in satin black colour. This product comes with a two-year warranty. 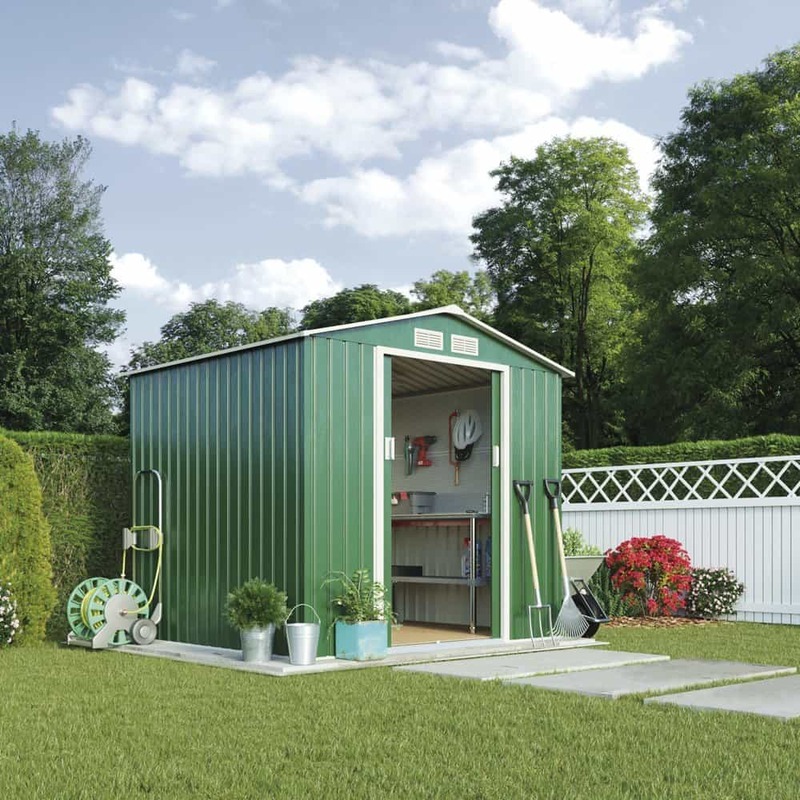 The compact design enables it to fit in small spaces. The rotating blades make some buzzing noise. The Valiant (FIR361) Premium IV 4-Blade stands out for its performance and its built-in protection. It has a high airflow rate and is not damaged by high temperatures. These two and other features make up for the cost of purchase. The Valiant Ventum III is a three-blade compact stove fan that is powered by heat. It has an ultra-low operating temperature. The blades create a thrust of about 420 feet per minute at maximum speed. 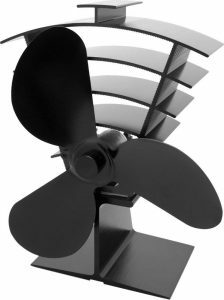 The design of the fan reduces the wobble effect with the spaces between individual blades designed to reduce the drag. Its top section has ridges of fins which increase the surface air by which the air is distributed. When combined with high blade speeds, the fan is effective in distributing heat across the room. Valiant Ventum III has a low starting temperature of about 450C. This means it can work well with top cooled stoves. The body is made of aluminium, which is not only strong and durable but also lightweight. Should your fan break down after the two-year warranty period, you can purchase the fan and motor parts online. Replacement of the parts does not require technical expertise. Comes with a thermally controlled actuator that optimizes Peltier performance. It can operate at low temperatures. It has a fin design that maximizes the air flow across the room. The fan gets clogged with dust pretty fast which causes it to make cranking noises. 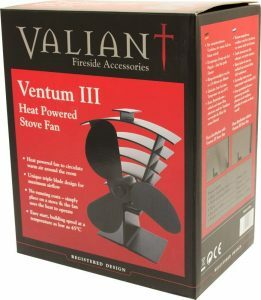 Valiant Ventum III is one of the best performing stove fans on the market. It combines a robust build and innovative features to offer effective heat distribution in medium to large rooms. It is compact. 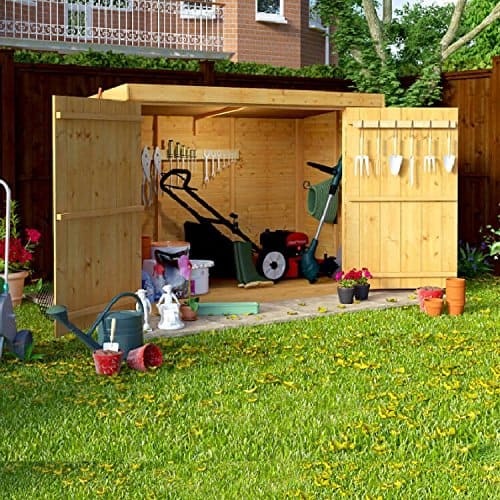 Therefore, it can fit conveniently in small rooms. We have reviewed the best three stove fans. Each of the stoves has its unique features that make it stand out. The Von Haus 3 Blade Stove fan has a self-regulating mechanism which controls the amount of heat distributed. The Valiant (FIR361) Premium IV 4-Blade has the inbuilt protection that prevents heat damage. 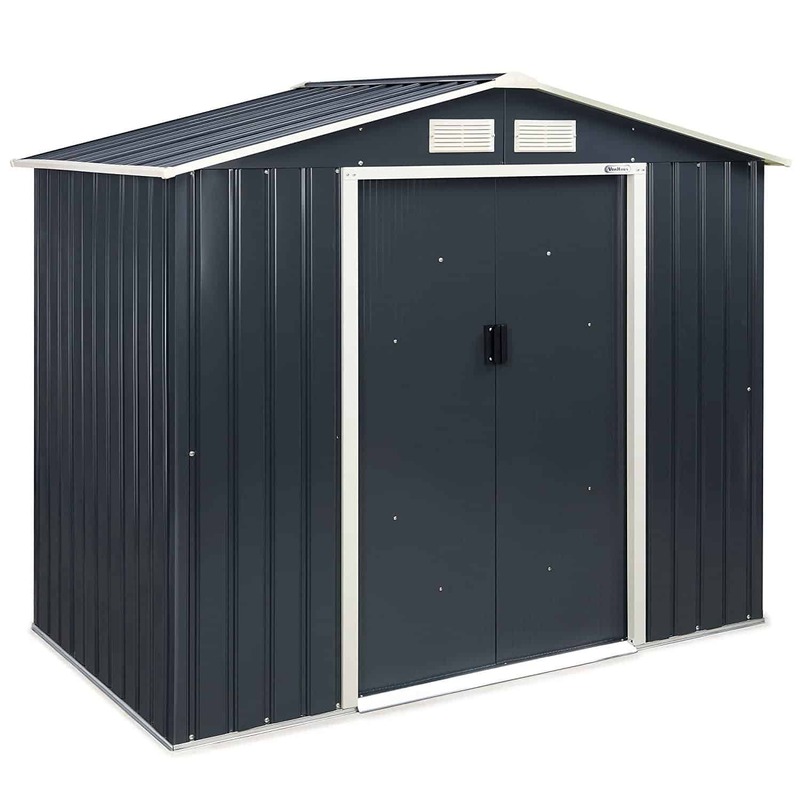 The Valiant Ventum III has a low minimum operating temperature and a high performance. However, after comparing the three models, one stove fan stood out above the rest. 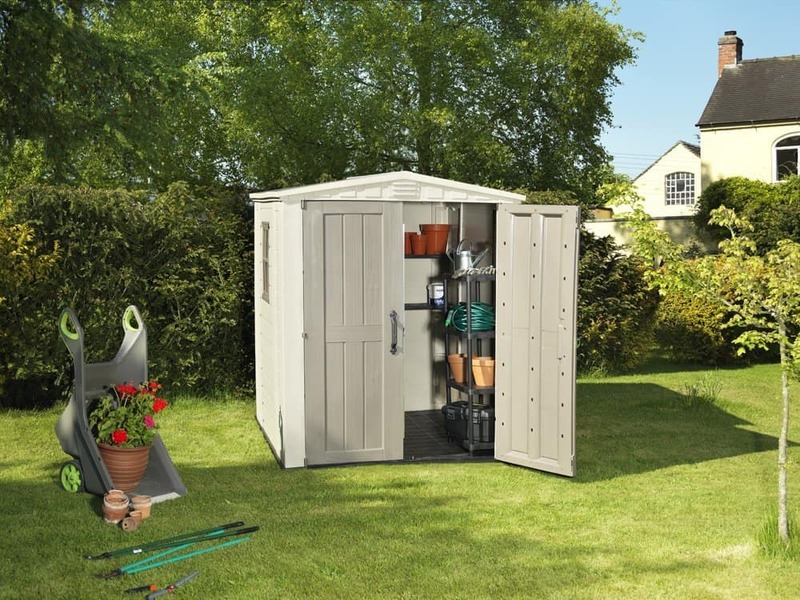 At Garden Shed Reviews, we recommend the Valiant (FIR361) Premium IV 4-Blade. The stove fan is not only durable, but also efficient in distributing heat across the room. It generates airflow of about 420 cubic feet a minute that equals to that of the best performing brand in our list. 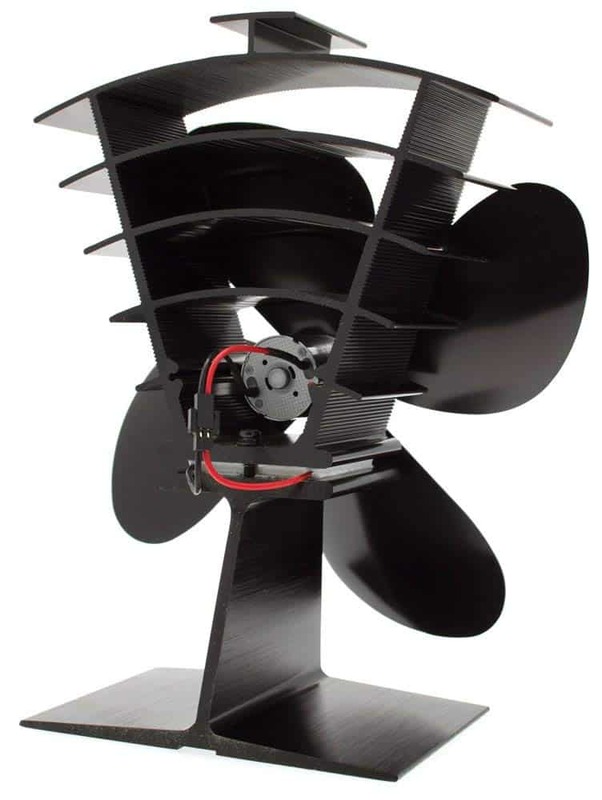 Its four blades provide better airflow than a three-blade fan without creating lots of drag. It has radiating fins which increase the surface area for the heat distribution. Just like our best performing fan on the list, it has a long motor life and provides a consistent output over a long period. Its thermally controlled actuator optimizes the Peltier performance enabling it to create a high airflow all the time. In addition to the above features, Valiant (FIR361) Premium IV 4-Blade has the inbuilt protection that shuts it down when the heat goes beyond the operating maximum. 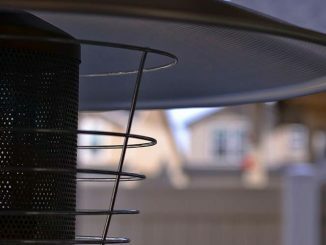 This feature is vital in enhancing the durability of the fan. Its body is made aluminium which is durable but yet lightweight. 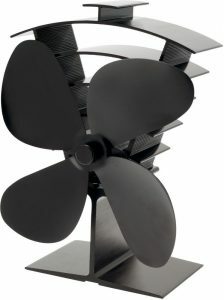 The fan offers premium quality features and functionality with a much lower price tag compared to the competing brands. Moreover, the fan comes with a two-year warranty which is an added value to the customers. A pellet or log stove is one of the cheapest and most efficient ways of warming your house. However, without a means to distribute the heat across the room, the stove may not warm you well enough. Thanks to the stove fan, you can have the heat distributed across the room to get everyone warm without sitting next to the stove. If you have a pellet or log stove at home, consider any of the above fans for heat distribution. They use heat for operation and therefore do not increase your energy bills. We believe that any of the three stove fans can solve your housewarming needs effectively.